According to this week's episode of The Office (quite a reliable source), most New Years resolutions are broken by February. 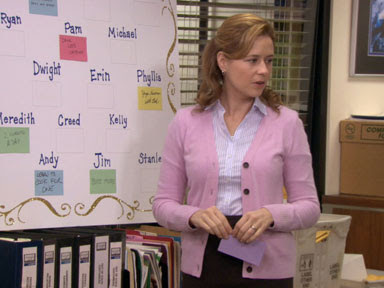 Pam Beesly has inspired me to take a look at a few of my health and lifestyle goals for 2011. Fight becoming a cubicle couch potato. Everyday doesn’t have to be a blow-out gym session. Getting away from my desk and just walking around the block does wonders for my daily cardio and gives my mood a boost. Decaffeinate. I’m going to start by cutting down to one cup of coffee per day. Caffeine can alter your body’s response to insulin which is a concern for me. Extra stimulants are not welcome here! Embrace Low GI foods. The Glycemic Index (http://www.southbeach-diet.info/glycemic-index-context.php) is used to determine which foods cause a bigger insulin surge than others. Being aware of smart choices is important. Who knew that beets are lower GI that carrots? Go Greek: Get your mind out of the gutter! I’m talking about yogurt! I keep some fat free Greek yogurt on hand to substitute for mayo or sour cream. It’s creamy and tangy and almost always does the trick. Clever swap outs can really save in calories. Appreciate baby steps. Any lifestyle change, no matter how small takes time to adjust to. I’m trying my best to appreciate that a step in the right direction is always better than a step backwards.